On Friday, hundreds of CWAers rallied outside AT&T's annual shareholder meeting in Dallas, Texas, and called on the company to negotiate a fair contract that keeps family-supporting jobs in their communities. 14,000 AT&T workers covered by AT&T’s Midwest and Legacy T contracts have voted to authorize a strike if AT&T refuses to offer real solutions at the bargaining table. "We're out here because we have many call centers that have closed. Cities have been devastated," said CWA District 4 Vice President Linda L. Hinton. "This is a wealthy, growing company, and it's our CWA members – their employees – who have helped build this company. Our members deserve a fair contract. It's about jobs and employment security for everyone." "We deserve a fair and equitable contract," Vice President of Telecommunications & Technologies Lisa Bolton said. "We are not asking for anything unreasonable – just good wages, good benefits, and job security. After AT&T pushed and pushed for that tax bill to go through, AT&T CEO Randall Stephenson was out in the public making statements that there will be 7,000 new jobs. Only weeks later, what did he do? He laid off 1,500 members. These contract negotiations are an insult to every one of you and every one of your families." District 6 Vice President Claude Cummings said, "Already in the first quarter of 2018, AT&T has made $4 billion in profit. You made that money for them. We shouldn't have any takebacks on the table. We want a fair contract with good wages, good benefits, and job security." The shareholder meeting came just after CWA released a new report last week examining AT&T's continued role in hollowing out the middle class by eliminating thousands of jobs, closing call centers, and moving jobs to low-wage and overseas contractors. While AT&T refuses to release details about plans for its $20 billion in tax savings, the CWA report finds that AT&T has closed 44 call centers and eliminated 16,000 call center jobs in the last seven years. Hundreds of CWAers, including CWA District 4 Vice President Linda L. Hinton, Vice President of Telecommunications Technologies Lisa Bolton, District 6 Vice President Claude Cummings, and Public, Health Care and Education Workers Vice President Brooks Sunkett, rallied outside AT&T's annual shareholder meeting in Dallas, Texas, and called on the company to negotiate a fair contract that keeps family-supporting jobs in their communities. New Jersey CWA members ratified a contract with Governor Phil Murphy's Administration covering 35,000 workers employed by the Executive Branch of New Jersey State Government. "We are heartened to reach this fair agreement with the Murphy Administration," said CWA District 1 Vice-President Dennis Trainor. "This is a great day for New Jersey and the working men and women who dedicate their lives to making state government run." The contract addresses all retroactive increments and clothing allowance payments, provides two across-the-board pay increases of 2%, and came with no concessions – a major victory rewarding years of solidarity by CWA members throughout the state and the hard work by the bargaining committee. 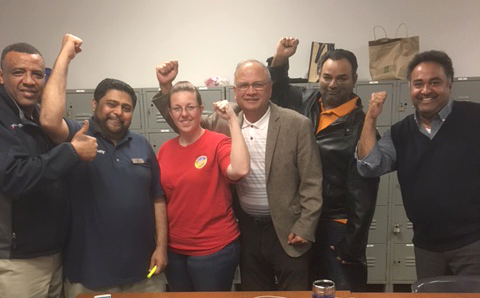 DTG rental agents at the Los Angeles International Airport, members of CWA Local 9003, voted overwhelmingly to ratify their first-ever collective bargaining agreement. The agreement includes retroactive pay, wage increases that averaged an immediate 22% increase with substantial increases every year over the life of the contact, institutes a comprehensive grievance process, and maintains benefits with no premium increases. About 250 utility meter installers at Aclara/SGS, members of CWA Local 1109, ratified their first contract. The contract, which members called "life-changing," will double members' base wages over the life of the contract, institute paid time off for the first time, provide job protections, and much more. After years of making phone calls, holding rallies, and lobbying Members of Congress, CWA members succeeded in getting their top priority items included in the FAA Reauthorization Act of 2018, passed last week by the U.S. House of Representatives. Now the bill will head to the U.S. Senate for consideration. The bill includes AFA-CWA's top safety priority — instituting a minimum rest period of 10 hours for Flight Attendants, giving them equal rest with the flight crew, along with protections against eroding U.S. aviation jobs and enhancements to the security of our aviation system. Read more here. The bill also includes stronger protections for airline passenger service agents from passenger assaults. Agents are often the target of passenger frustration with delays, baggage fees, and other airline policies. Agents have reported being verbally and physically assaulted by customers, including being hit, having luggage and equipment thrown at them, being pulled over counters, and getting spat upon. Read more here. CenturyLink has announced plans to cut jobs across the country, despite receiving $1.1 billion as a result of last year's Tax Cut and Jobs Act. "CenturyLink has made its priorities clear. Instead of looking out for their customers and employees, they are chasing short-term gains in order to boost stock prices and put more money in the pockets of their large shareholders and top executives," said Brenda Roberts, Vice President of Communications Workers of America District 7 which represents more than 11,000 workers at CenturyLink. "It's disgraceful," said Lisa Bolton, Vice President of CWA's Telecommunications and Technologies Sector. "Cuts like these devastate working families and the communities that CenturyLink serves. CenturyLink is laying off well-trained, dedicated employees and trying to get by with low-wage contractors while CEO Glen Post looks forward to a gold-plated retirement." CenturyLink came under fire last year after paying huge bonuses to top executives while claiming to be too short on cash to pay traditional Christmas bonuses to employees. CEO Glen Post, who earned $14.7 million in total compensation last year, has announced that he will retire after next week's shareholders meeting. At the District 6 conference in Dallas, Texas, last week, CWAers came together to plan and discuss how to make CWA STRONG. District 6 Vice President Claude Cummings, CWA Secretary-Treasurer Sara Steffens, and Health Care and Education Workers Vice President Brooks Sunkett spoke to the attendees about what every CWA member needs to do to fight back against unprecedented attacks on working people and our ability to join together to take action for a fair return on our work. 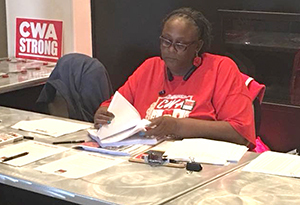 Below: AT&T Mobility activist Robin Johnson of CWA Local 6215 asked District 6 conference delegates to contribute to PAF, the political action committee for the working people of CWA, their families and retirees, and to sign the CWA STRONG pledge. 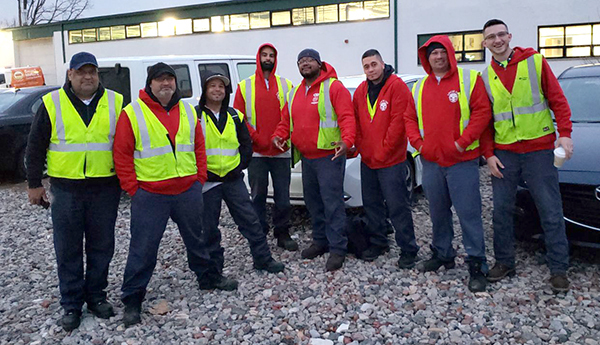 Eight employees at the American Red Cross in Utica, N.Y., joined CWA Local 1123. CWA represents Red Cross health care workers in New York, Pennsylvania, and the Mid-Atlantic. The NewsGuild-CWA marked World Press Freedom Day today by honoring journalists who put their lives and liberty on the line in search of the truth and calling for support of press freedom. "This is truly a dangerous time to be a journalist," noted the NewsGuild-CWA in a statement. "As Reporters Without Borders reported last month, hatred of journalism threatens democracies – today even more than it did just a year ago. In the U.S. in 2017, there were 45 physical attacks on journalists, 34 arrests, 15 searches or seizures of equipment, and five border stops of journalists." The NewsGuild-CWA also called attention to the economic forces that reduce press freedom. "Press freedom cannot thrive when media outlets lack sufficient reporters, photographers, and editors to cover local news in cities and towns across the country." 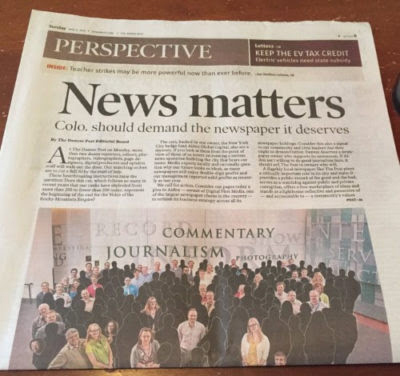 In an act of defiance, the editorial board of the Denver Post demanded that Alden Global Capital, its extremely profitable hedge-fund owner, invest in the papers it controls or sell them to someone who will.